Fall has arrived in Florida. It still gets warm in the afternoons -- even hot, as it has in the last couple of afternoons -- but the air is also quite a lot drier than it was during the summer, meaning that nights, especially in the northern part of the state, have gotten cooler. But, fall also means that the state has inched into a less rainy season. October is the driest month of the year in the panhandle and far northern part of the peninsula and is followed by somewhat more frequent rains by late fall and winter. In the rest of the state, however, the dry season continues into the winter. Even if it doesn't rain much, we cannot stress enough the importance of reporting your zeroes. A daily rainfall total of zero is an important data point, and your reporting zeroes helps us get more data points to support the many uses that arise from CoCoRaHS data. So, please, report those zeroes! Not to jump too far ahead toward winter weather, but we would also like to request that, if you have a thermometer at home, you begin reporting your morning low temperature and the presence of any frost in your comments. 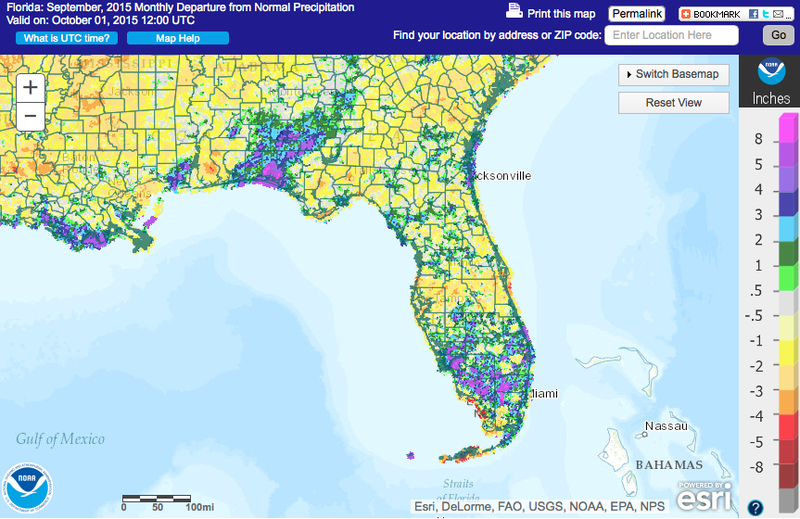 Doing this helps National Weather Service forecasters and other data users get a better idea of where freezing conditions, which are critical to agricultural interests in Florida, have occurred. 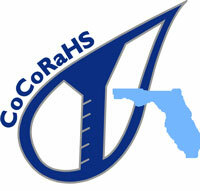 Recently, CoCoRaHS has launched a new feature called the Condition Monitoring Report, which can be viewed here. These reports can be used to note drought or very wet conditions at or near your regular observing location. Please feel free to make these reports as you see fit. We hope that you will enjoy this newsletter. In it, you'll find a summary of Hurricane Matthew, which ravaged areas near the east coast of the state recently, some photos of Hurricane Matthew from an observer on St. George's Island, the outlook for winter, and more. The center of Hurricane Matthew tracked just east of Florida's Atlantic coast on 7 October. It did so after quite a spectacular history in the Caribbean Sea. An easterly wave exited western Africa around 22 September, after which it moved just south of Cape Verde. By the time it approached the Lesser Antilles, thunderstorm activity had developed. Passing by Barbados, it was christened as Tropical Storm Matthew on the 28th. Thereafter, steered due westward by strong ridging to the north, Matthew entered the Caribbean Sea and encountered very warm waters and a marginal wind shear environment. On the 29th, Matthew strengthened into a Category One hurricane. Despite the presence of northwesterly wind shear, the storm underwent explosive development and rose to Category Five strength by the afternoon of the 30th at a latitude of 13.3 degrees north of the Equator, making it the strongest hurricane on record at such a low latitude. Matthew also maintained Category Four or Five strength for the longest duration of any hurricane in the eastern Caribbean Sea on record. Slowing down and weakening slightly to Category Four strength, Matthew eventually turned northward and accelerated on the 2nd. On the morning of the 4th, it made landfall on Haiti at Category Four strength, making it the strongest hurricane to make landfall on the nation since Hurricane Cleo in 1964. That evening, it made landfall on eastern Cuba. Although the mountains of the Cuba disrupted the structure of the storm, Matthew was able to re-strengthen to Category Four strength between Cuba and the Bahamas. The storm then crossed the Bahamas -- making it the only storm on record to make landfall on Haiti, Cuba, and the Bahamas as a major hurricane (Category Three or greater) -- and approached the eastern coast of Florida in the Melbourne area on the 7th. Thereafter, it paralleled the coast, with the center of the eye remaining 30 to 40 miles off shore, until it moved into waters off shore of Georgia late on the 7th. Ultimately, having maintained Category Three strength or greater for 7.25 days, Matthew was the only hurricane on record to have done so in the Atlantic basin after 25 September. In Florida, sustained hurricane-strength winds (greater than or equal to 75 miles per hour) were confined to the immediate coast, especially the Space Coast. Tropical-storm-force winds (40-74 miles per hour) extended inland from Miami northward as far west as the middle of the peninsula. The highest gust observed was 107 miles per hour at a station on an Air Force tower at Cape Canaveral. Rainfall was moderately heavy. Storm totals were highest in the St. Augustine and Jacksonville areas. The very highest storm total of 9.97" was registered by a CoCoRaHS observer at St. Augustine 12.2WNW. The western side of a tropical cyclone tends to be the weaker side, with steep gradients in rainfall totals with distance from the cyclone center, so areas generally west of the spine of the peninsula had comparatively little rain from Matthew. Map of rainfall totals for the week ending on the morning of 9 October for the coastal Southeast. Rainfall from Hurricane Matthew accounts for most of the total. Courtesy: NOAA/NWS. Perhaps the biggest story of Matthew in Florida was the storm surge and beach erosion. Storm surge reached four to six feet along the First Coast and in Flagler County, among the top two events after a hurricane in 1898, the last major hurricane to pass so close to that coastline. Beach erosion was severe in many areas, compromising the foundations of buildings and near-coast roadways, such as the A1A. Flooding from storm surge at St. Augustine. Courtesy: News4JAX. Damage to the A1A in Flagler Beach from beach erosion because of Hurricane Matthew. Courtesy: Miami Herald. Lest anyone forgot, Hurricane Hermine struck Florida in early September. It remains in sharp focus for some folks who were impacted by it. Jo Ellen Pearman (FL-FR-6) is an observer on St. George Island in Franklin County in the Panhandle and rode out Hermine in her home. She was kind enough to send along a few photos of the storm. In September, nine new observers joined in Florida. They hailed from Duval (one observer), Hendry (1), Hillsborough (1), Madison (1), Martin (1), Miami-Dade (1), Palm Beach (2), and St. John's (1) County. Their station numbers are DV-79, HY-6, HB-117, MA-23, MT-26, MD-65, PB-81, PB-82, and SJ-24. 10 September, Live Oak 0.4NE, Suwannee County (FL-SW-1): "The mornings are nice and feel cool, but each one is warmer than the last as each day gets warmer, as well. Beginning to be needing rainfall again soon." 14 September, Edgewater 2.4N, Volusia County (FL-VL-6): "This [rainfall of 2.43"] was from the soon-to-be-named Tropical Storm Julia, which brought gusty winds and most of the rain mid-day yesterday, and was declared a TS by the NHC last night at 11pm." 21 September, Palm City 4.0SW, Martin County (FL-MT-1): "I received just over one inch of rain between noon and one PM ,two miles north of my station the road was dry." 27 September, Avon Park 0.8E, Highlands County (FL-HL-2): "Found a thirsty lizard along with 0.73 inches of rain from an early-afternoon thunderstorm. Plants in the yard look happy again." 7 October, Auburndale 1.1W, Polk County (FL-PK-50): "Hurricane Matthew began making its presence felt around 11am, with a few showers and gusty winds. By 4pm, winds were steadily increasing. Barometer began falling in earnest around 9pm. Gusty winds and squalls in the overnight, with the barometer bottoming out at 998.5mb around 5am. Worst conditions occurred between 6am and 8am, with Trop. storm gusts and moderate rainfall, including at the time of observation. Measurement may be slightly low (approx. .04") due to spillage in the hurry to get inside from the driving rain... "
September 2016 was the 40th wettest on record statewide in Florida. However, the usual variation in rainfall totals was present. The wettest areas relative to normal were those areas, including the Big Bend and parts of the western coast and inland central peninsula, that received substantial rainfall from Hurricane Hermine. The drier areas relative to normal, including the central and western Panhandle, the northeast, and the south (excluding the Keys), did not have rainfall from Hermine. Below are rainfall totals and their departure from 30-year normals for September 2016 for select locations across Florida. Data were compiled from the National Weather Service. Note that all totals include rainfall from Hurricane Hermine. Below is a contour map of total September rainfall based entirely on your CoCoRaHS observations. Map is courtesy of a utility in the Midwestern Regional Climate Center's cli-MATE browser. Note that the totals depicted here include rainfall from Hurricane Hermine. Below is a contour map of total September rainfall relative to 1981-2010 normal values (as a percentage) based entirely on your CoCoRaHS observations. Map is courtesy of a utility in the Midwestern Regional Climate Center's cli-MATE browser. As of the most recent U.S. Drought Monitor issuance, the Panhandle west of the Apalachicola River was labelled as having abnormally dry (D0) conditions, with even a sliver of moderate drought (D1) conditions in northeast Jackson County. With more frequent rains in September and, more recently, the heavy rains of Hurricane Matthew, the dry conditions along the eastern coast of the peninsula have been eliminated. The dry conditions on the Panhandle are unlikely to be alleviated substantially in the short term, as autumn is one of the area's dry seasons before rains become somewhat more frequent in the winter with more frequent visits from cold fronts. We may be in the midst of fall right now, but winter is right around the corner. An important factor that influences how relatively cool or warm and dry or wet a Florida winter turns out to be is the phase of the El Niño-Southern Oscillation, or ENSO. ENSO is a teleconnection pattern governed by coupled ocean-atmospheric processes in the equatorial Pacific Ocean and is manifested in the sea-surface temperature (SST) in that region. The positive phase of ENSO, known as El Ni ño, manifests itself in warmer-than-normal SSTs in the equatorial Pacific; the negative phase, known as La Ni ña or El Viejo, manifests itself in cooler-than-normal SSTs; and near-normal sea-surface temperatures are associated with a neutral phase of ENSO. ENSO's ocean-atmospheric coupling "teleconnects" to atmospheric flow patterns around the world, especially during the winter. Accordingly, in some places, including Florida, having a good idea about the phase of ENSO gives us a good idea of how winter will be. So, here is how SST temperatures look in the equatorial Pacific right now. The above plot shows anomalies of SST -- or deviations from normal SST -- in the Pacific Ocean for the month-or-so-long period ending on 8 October. The shades of blue in the equatorial region indicate that SSTs have averaged below normal during that period. If they can remain below normal for long enough, then a La Ni ña event will have commenced. In fact, forecasters at the Climate Prediction Center, using predictive dynamical and statistical models and other tools, have very recently forecast that odds how tilt toward the development of La Ni ña later this fall into the early part of winter. And, here's what La Ni ña looks like in terms of winter (we'll use January) precipitation anomaly across the contiguous United States. The above plot suggests that, during a La Ni ña winter, drier-than-normal conditions prevail in Florida, especially on the peninsula. Here's what La Niña looks like terms of winter temperature anomaly. The se plots show that above-normal daytime temperatures are typical in Florida during a La Niña winter. The signal is less clear for nighttime temperatures, especially on the peninsula. All in all, the odds seem stacked for a warmer- and drier-than-normal winter in Florida given the current status of ENSO. However, it must be emphasized that other mechanisms and factors affect winter seasonal climate in Florida, so the presence of a La Niña event, however uncertain itself, is not fully deterministic of how this winter will proceed. The prospect of a La Niña event does give us some ideas, though.